Ms. Nguyen was born in Vietnam and moved to California in 1994. Her patients and the Oakland City Staff know her as Trang. Having graduated from Alameda College class of 2003 with a certificate in Dental Assisting, Ms Nguyen received her Registered Dental Assistant License in the same year. Ms. Nguyen has 14 years of dental experience and loves all aspects of dentistry. 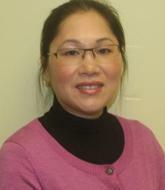 Aside from her dental education and experience, Ms. Nguyen has built close and intimate relationship with her patients. She not only has the ability to comfort patients but to clearly explain what is going on during a dental treatment.